This whole incident is so sad !! yes Avinash .. no matter what the reality was .. at least .. making political staircase on the dead is criminal .. for any party or individual .. thats the ultimate fate .the law of the land should be forcing to bring facts out and ask the political parties to stop the nonsense. well.. wish that was a solution dear Harsha .. we still need administrators.Its time, young and genuine Indians to step in truly.They who believe in the word democracy and secularism in the true sense .. and are spiritually awake ! I sometimes wonder how or why people vote for leaders who give politics a bad name. But I guess I have no right to speak on the issue. At least u have done a cartoon…what do I do…just read and hear and move on with life. How many of us r really doing what we ought to do to change things…whereas those actively involved in bringing about the change land up losing sight of their goals. Sigh! Shivani .. we all need to do a little bit as much as we can .. educating people around at the least we can do …literacy will bring spiritualism awakening and sense of understanding,sense of curiosity and questioning and things will start changing .. society will bring right people on the chair .. after all even these leaders are one among us .. why blame them solely .. the society as a whole is to be blamed ! Sad but . . .Jo Main Log hain unka tau kabhi kuch nahi hoga. . .
Indian Politics is much more masaledaar than any Saas-Bahu serial by Ekta Kapoor. Pity it is that such a handful of nuts are deciding the future of our country. Sigh! and interstingly they are us .. they are a part of the same society .. its the society which needs to be cleaned .. I wish entire India would follow Shri Shri Ravi Shankar.. spiritualism is lacking in the country .. and its time it be refueled .. let the evil inside ask .. what am I going to do being bad ? am I immortal ? Bush it would be unfair to declare Indian courts take wrong judgement or are popular for doing so.. In fact, there are 100s of countries where law and order does not even exist.We are still lucky. my point here was on humanity grounds can we just not politicize such incidents for drawing sympathy votes ? yes .. Vijay ji ..what Congress is trying to do is gain sympathy votes … doubt votes … default votes …illegal migrant votes .. votes .. and only votes ..
Well even BJP would have played the same cards had they been in Congress’ place , who knows ..
Point is .. good or bad .. people who are no more existing should their name still be used for political benefits , ethically or should I say on humanity grounds ? 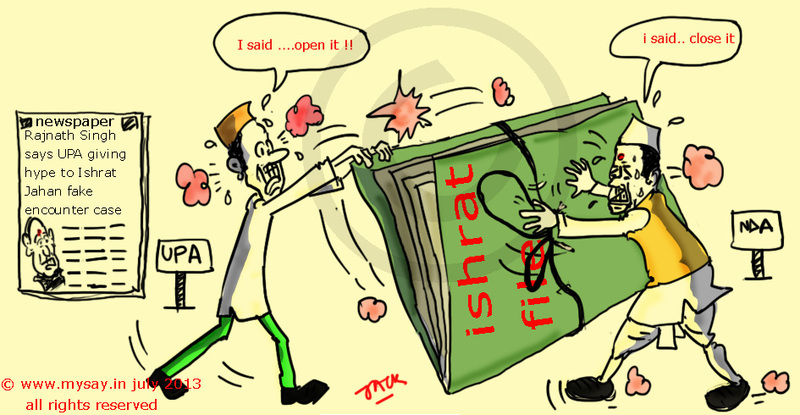 I am at a loss for words the way you portray contemporary issues in your doodles….again they are of a class apart….